WWW, November 2014 - Reverb and delay: the two basic effects for a Dub mix. In this third chapter of REASON 8.0 IN DUB, both effects are subject to a deeper reviewing in word, sound and sight. 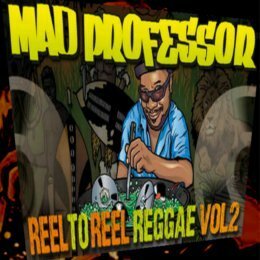 Another original Reggae riddim was created, rendered to eight audio tracks and imported into a multi-track DUB set up in Reason. A report. 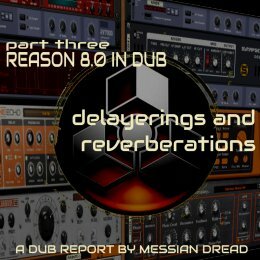 Before we'll take a look at some of the delay and reverb devices and -more important- see and hear them in action, a few words about creating a riddim in Reason. Reason 8.0's new browser is a tremendous help during this process. Where it's rather obvious how the quality of the work-flow had dramatically improved since Reason 3.0, this browser in itself contributes significantly to it. 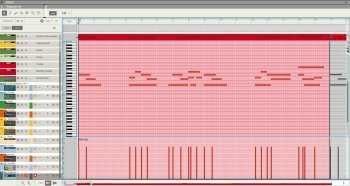 Picking sounds for your sampler or drum computer goes very quick, especially when you use the drag-and-drop possibilities. Love it or hate it: the Neptune Voice Synthesizer does it's work quite well. Just load a few vocal samples and make sure they're fit in the rhythm. 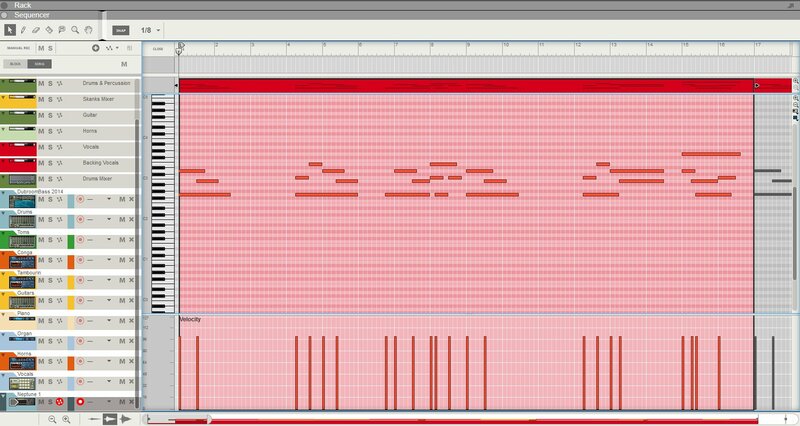 After this, make a little midi harmony in the Neptune's sequencer channel (see picture right, click to enlarge), make sure the vocals feed the Neptune and you have your very own harmony vocals 21th century style. 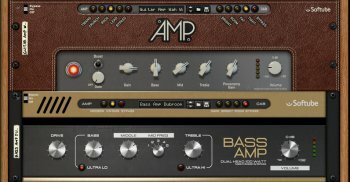 Another thing worth mentioning here are the two amps created by Softube that ship with Reason 8.0. 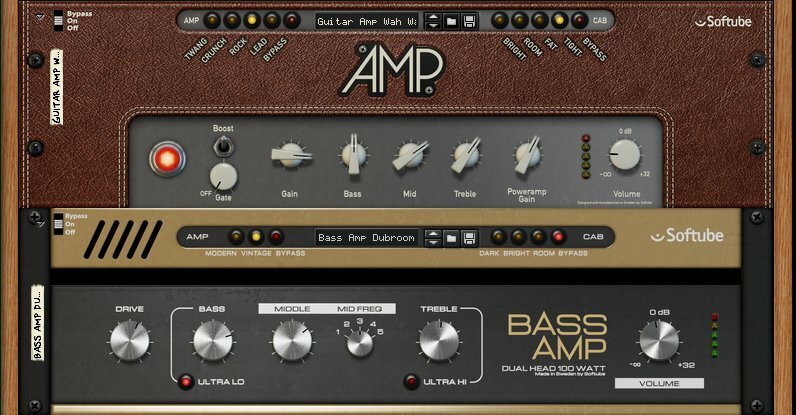 When you want to use real guitar sounds next to the real bass guitar sounds, both the guitar amp and the bass amp do a wonderful job. The wah-wah guitar you'll hear in the mix has a significant better sound when run through the amp and so does the bass. Creating a riddim is as easy as your inspiration will let you fill in the blank sequencer. It does take computer power, though. Even running the DAW in 64 bit modus with full 8 gigabytes available will not let you set up a complete Dub environment while using all the instruments. Rendering your riddim to audio tracks solves that problem and will bring you directly in the situation wherein Dub is actually made: after all, it's a remixing technique of multi-track recordings or "stems". For this series, a special multi-track Dub environment was created in Reason. 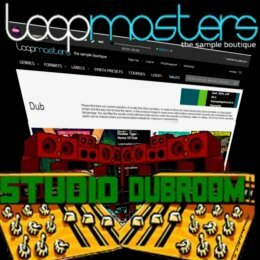 Unfortunately it's not possible to make the stems available for download because of license limitations, but when you take a look at the Dubroom's tutorial on making Dub with computers or at the graphic right (click to enlarge), you'll get the idea. 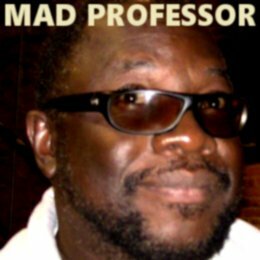 This is the principal according to which the Dub environment is set up. Since Reason's console has eight auxiliary outputs, you'll have the possibility to connect six effects. Route the output of the effect devices to a channel input and you can layer effect over effects. This is exactly what's going to be done quite heavily in the Dub that was made for this report. Now, let's take a closer look at the effects themselves. In the Dub mix, you'll hear both reverb devices or just the DR-1. At the console, the two channels at the far right feed the devices. There is quite a difference to be heard when you hear both reverb devices, as both devices come back into the console in the same channel. To achieve this set up, use was made of the FREE Audio merger and splitter Rack Extensions by Blamsoft. 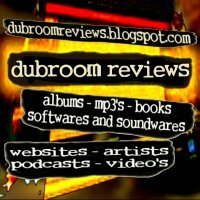 You'll hear a little bit from the Echobode Rack Extension. This is a frequency shifter and delay device that at this point is yet to be reviewed deeper. THE ECHO is taken to a deeper level as well. Of course, the manual delay (aux 1, more info here) and the RV-7000 with a Dubroom Ping Pong delay preset are featured. The T2 Phaser (available for around 15 euro at the propshop) does some crucial things to the drums. A Dubroom preset is used for it. This is a heartically recommended Rack Extension. Just listen to what it does with the drums! The signals feeds like the Ping Pong delay, which at it's turn feeds THE ECHO. That's just one layering of effects used in this mix. There's a lot more going on, all possible because of the way everything is routed. Tweaking the EQ on the reverb channel is quite effective, but that was already made clear in the previous dub mixes. It's not easy to create Dub effects in the lower frequencies (read: bass line), but both the DR-1 and the RV-7000 showed to be perfectly able to deal with the deeper realms. They sound nice together as well. To conclude, a word about the Echobode. The first audible patch was taken and the thing tweaked just a little bit, without being hindered by any knowledge of the device itself. This in itself showed a potential that most certainly will be looked at more in-depth. 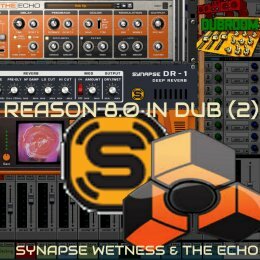 WWW, November 2014 - For this second part of REASON 8.0 IN DUB, Messian Dread created another original riddim and took a thirty-day trial of the Synapse DR-1 Reverb Rack Extension. 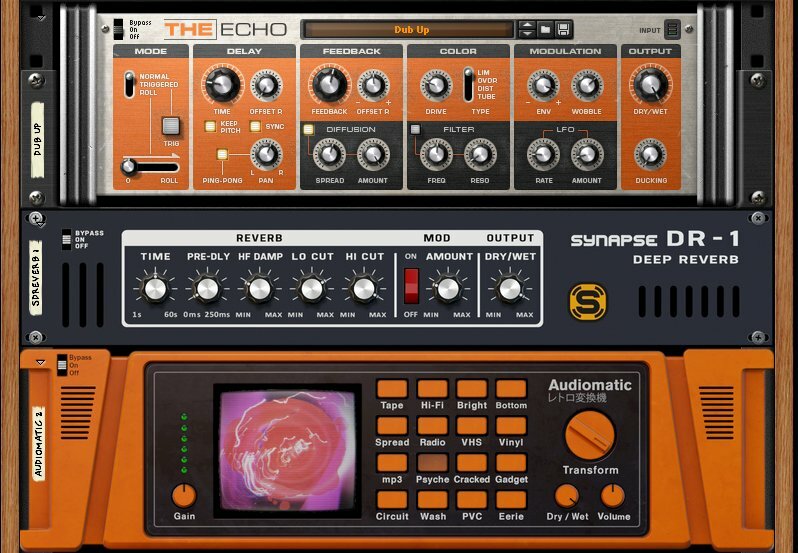 He also tweaked THE ECHO in what became yet another fat Dub created only with Propellerhead's Reason 8.0. Another report from the studio. Reason's RV-7000 Advanced Reverb does more than a decent job, especially when you consider it's the standard reverb in a 450 Euro DAW. It has been used by many producers whose choice was the RV-7000. Still, it turns out the blue device doesn't do everything and that's exactly where the DR-1 comes into focus. Taking a thirty-day trial for the 35 Euro Reverb device is free, and it turned out to be a very interesting choice. 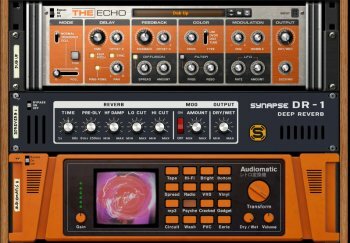 Another thing that really needed a deeper review is THE ECHO, Propellerhead's very own "Advanced Delay". 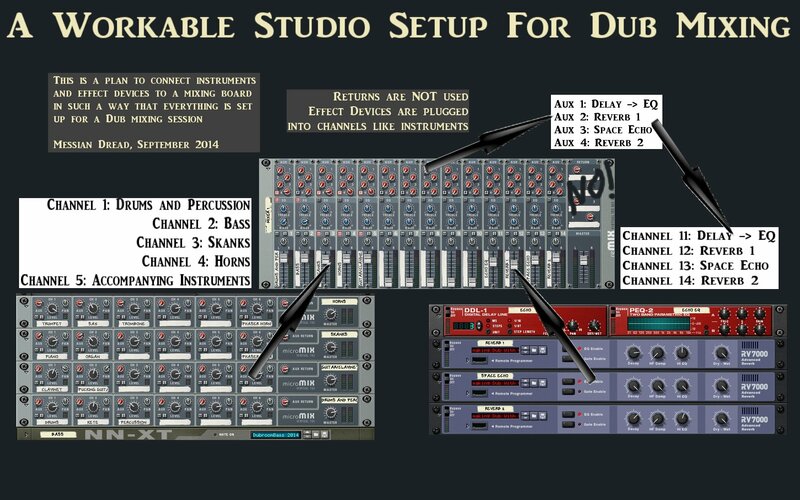 To see it live in action during a Dub mix is obviously the best way to discover some of it's features and that's exactly what can be done in this report. Yet a third thing is the bass. As it turned out, feeding the AUDIOMATIC with the "Psyche" preset, which at it's turn feeds the DR-1 produced a wonderful effect on the bass. 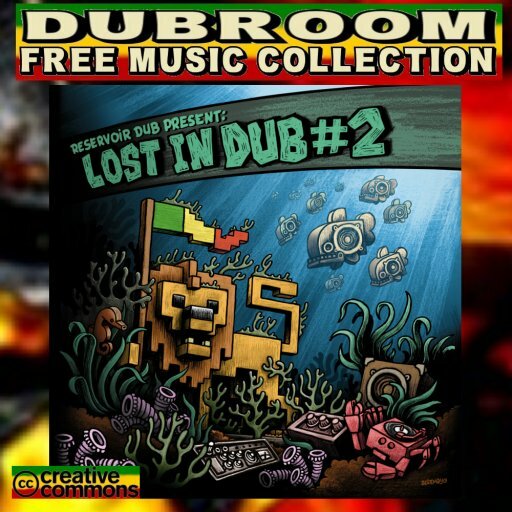 Before the Dub could be mixed, again from eight different audio tracks or stems, the riddim had to be made. Drums, percussion, bass, organ, piano, guitars, horns and vocals. Once again, the NEPTUNE Voice Synthesizer was applied to create some kind of effect on the vocals just because of the vibe it gives. For the vocals, just a few phrases were used. Once again, the bass amp was used for the bassline and two different guitar amps for the two different guitars. The horns went through DR Octorex's own filter before it was rendered to an audio track. When you would like to compare the DR-1 with the RV-7000, download the MP3 files. The two mixes are identical, the only difference is the reverb device. 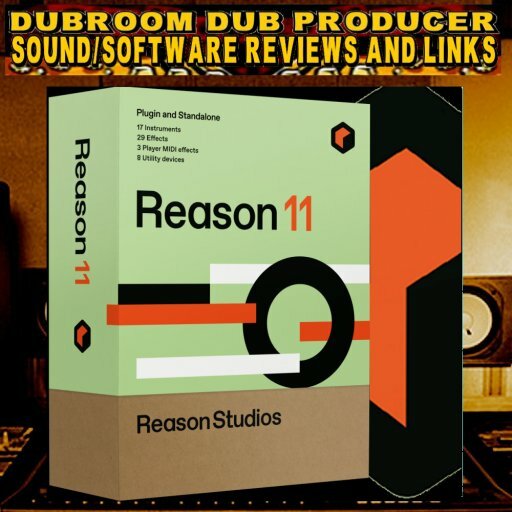 WWW, November 2014 - After the very well received review of Reason 8.0 especially for the DUB Community, the Dubroom continues to explore and review Propellerhead's flagship. 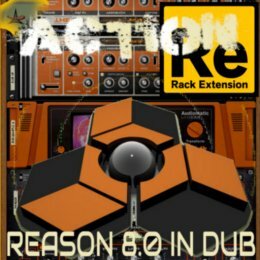 In "Action Rack Extension", Messian Dread mixes eight audio tracks into a heavy DUB using all six FX outputs on Reason's console. A report in sight and sound. 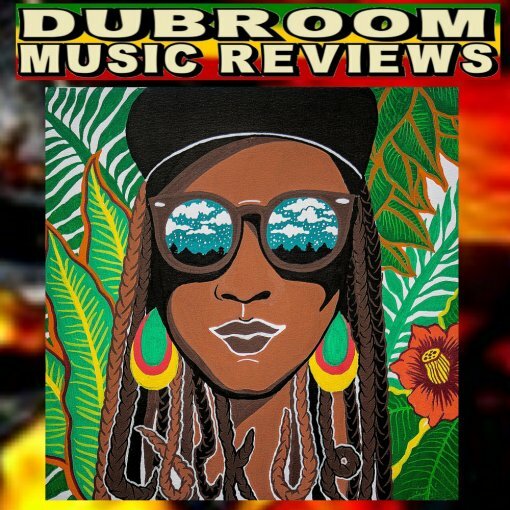 The best way to explore Reason, obviously, is to create riddims and make a Dubs from them. This is exactly what has been going on these last weeks over here in the Dubroom. At a later stage, more about creating riddims with Reason. 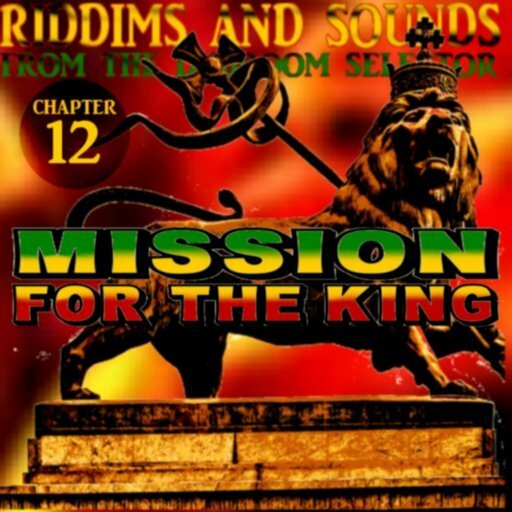 For now, just the report that creating riddims is a true joy and Reason has a positive role in the inspiration. Reason runs in 64bit on a machine with 8 Gigs of RAM and Intel processors of the newest kind. The software was loaded with drum computers, sound modules, loop players and of course the Neptune voice synthesizer. 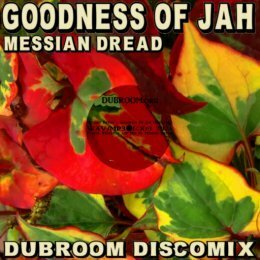 As soon as Reason hit the ceiling, the riddim was rendered to hard disk in the form of eight multi-tracks or stems. Unfortunately these multi-tracks cannot be shared as that would go beyond the Dubroom's license, but the result can be witnessed in the form of a You Tube video you can watch later on in this report. In fact, making a DUB from an audio multi-track is the authentic and original way of making DUB. 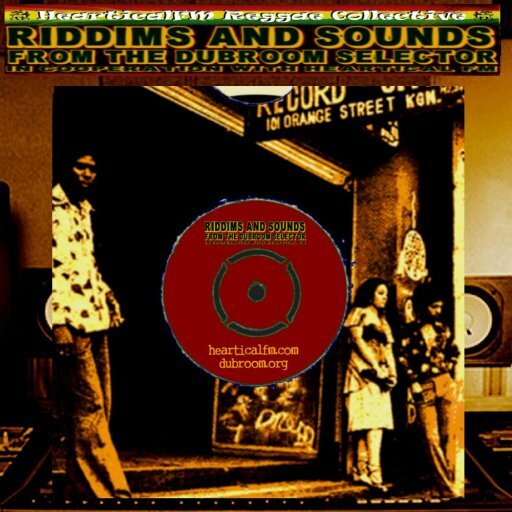 This is how the music came into existence, as the Jamaican studio bands played one riddim after the other into the multi-track recorder and the DUB engineer turned everything into that music we all love to play so much. This is exactly how the DUB for this report was made. Reason was set up with eight audio channels, one for sound FX, and six console input channels for all six auxiliary outputs. Yes, six different effect devices are used in this particular set up. Their output goes to console input channels. Over here, we don't deal with returns but you can read about these things elsewhere in the studio. Next to different RV7000's for delays and reverbs, The Echo was put in there as well as two Audiomatic devices. The Audiomatic is a Rack Extension, Propellerhead Reason's very own plug-in format. It ships for free with Reason 8.0, just like the excellent bass amp responsible for the warm and deep bass sound in this mix. 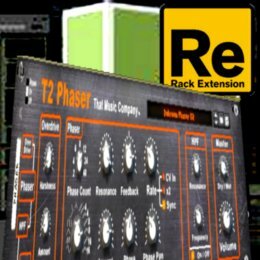 Another Rack Extension used is the T2 Phaser (review). You can download and use the device in your Reason rack for free for 30 days or decide to buy it. It's only about 15 euros and worth much more than that. In fact, for DUB created only with Reason the T2 is obligatory. Rack extensions work like any other device you can load in Reason's rack. Connect them, make a sequencer track and start recording your automation. The T2 and the Audiomatic Rack extensions turn out to integrate fully in a DUB environment. The Echo on top of that gives that extra touch but at this time, the device is not fully tested so there is much more potential than the stuff you can hear in the mix created for this report. After an initial sound check on the correctly connected set up, finally the DUB could be mixed. An exciting moment. This would show how much is true concerning Propellerhead's claims about workflow in Reason 8.0. Will there be hick-up's when the loop points are changed? Will everything be in sync in the first place? How about latency when you use the on-board soundcards with an ASIO4ALL driver? Everything went extremely smooth. Six different effects that take up their processing power, not to speak about the console itself and the eight different audio tracks can all be handled in virtual real-time. There's no experienceable latency, as the Reason sequencer records and plays the mixing automation. Both the Audiomatic and the T2 get their fair chance, especially in the second half of the mix when the two effects follow up on each other. The Audiomatic turns out to be crucial in deforming both the bass and the drums. Especially when combined with other effects (reverb), this little big thing can drive your mix to a next dimension. The T2 (reviewed here) is a very, very decent phaser that works excellently as well. The RV7000's and the manual delay do their thing. A ping-pong delay, a reverse reverb and a more or less standard hall effect for the RV7000 devices. The Echo is tweaked at a certain point showcasing some of it's potential, but there has to be some deeper exploring of the delay. 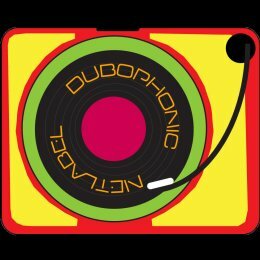 Even though not so much effort was put in the actual riddim, the result is a very reasonable Dub mix. Mixing the Dub is a true pleasure, and Reason's workflow plays a part in it, definitely. The technique behind the automation and everything is very high in quality and low in causing problems. 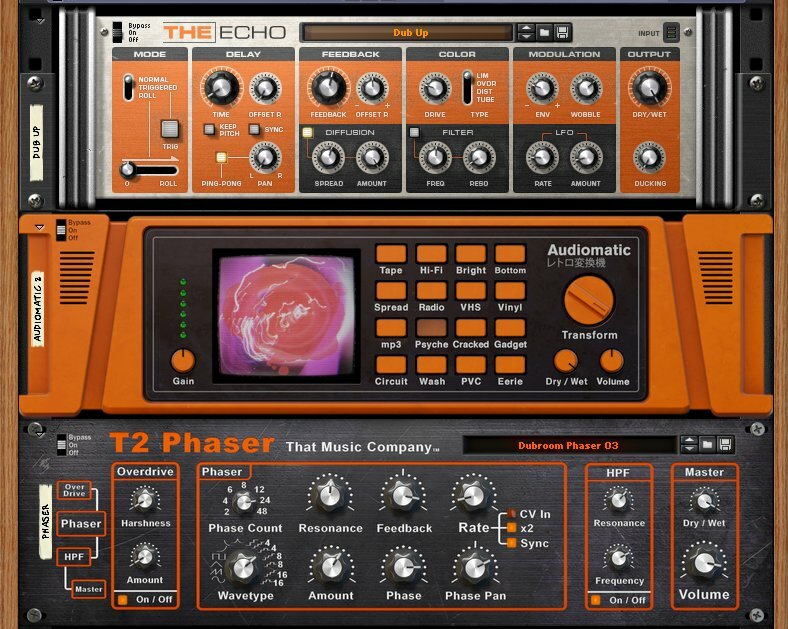 WWW, November 2014 - The in-program phaser in Reason is not the DAW's strongest feature. This very fact has been picked up by "That Music Company": they developed a very fine phaser which can be yours for the price of about 15 euros. Presenting the T2 Phaser Rack Extension! Rack Extensions. It's Propellerhead's name for the Reason internal plug-in format. You get a few when you purchase Reason, you can download one or two for free but the bulk can be discovered by visiting the "Prop Shop". For a DUB engineer, browsing the Rack Extensions can be, well, time-consuming. After all, most are aimed at the production of EDM ("Electronic Dance Music") and will not really add much to the standard effects and instruments in Reason. Not so with the T2 Phaser (see picture, click to enlarge). It's the second device created by the small Rack Extension developer "That Music Company", based in San Jose (California, USA) and it truly is an extension to your rack. First thing that stands out is the price. For about 15 euros, the T2 is yours. That's fifteen euros to de facto replace Reason's standard phaser because as soon as you run the T2 in your set up you'll hear the power in the thing. It basically has three main sections: Overdrive, Phaser and HPF (Hi-Pass Filter). Overdrive and HPF will add vibes to the main sound the Phaser section produces. You can set waveforms and on top of that, different steps. 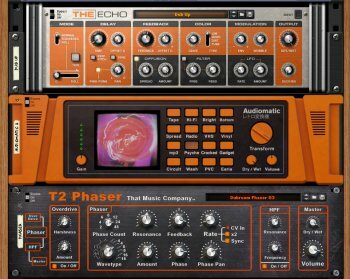 Pan effects belong to the possibilities too, you can even trigger the T2 by midi notes. Got Reason? Get the T2. It's that simple. Just download the phaser, you will have thirty days to discover the fully functional device before you will undoubtedly decide to have it permanently in your effect collection.